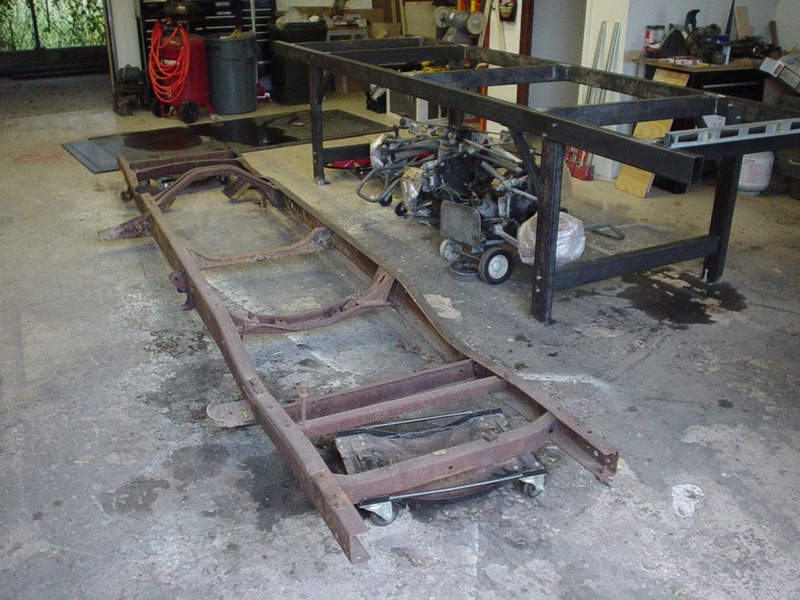 The next step I needed to take care of was to break apart the original frame to give me one frame rail to work with. I’m planning on building a new chassis but didn’t want to use the original frame, but I needed to get measurements from the original frame rail. So I began the process of cutting a cross-cut across the rivet heads and using a cold chisel to hammer off the rivet heads. Then once that was complete I’d knock out the rivets using a hammer and punch. At the time I had loaned out my shop compressor to a friend so I didn’t have use of my air tools and had to do this by hand. Man was this a back-breaking chore. It must have taken close to 30 hours to punch out all the rivets and get the frame to a state where I could separate the two frame rails. 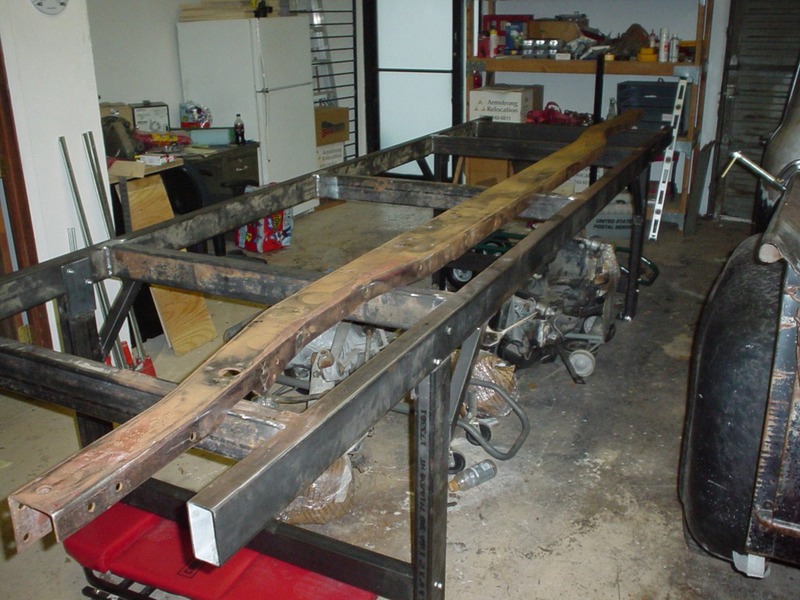 I then dragged the frame into the shop where I tried some creative solutions to try to separate the frame rails. In hindsight I probably should have spent more time punching out the rivets as this would have made the job easier. 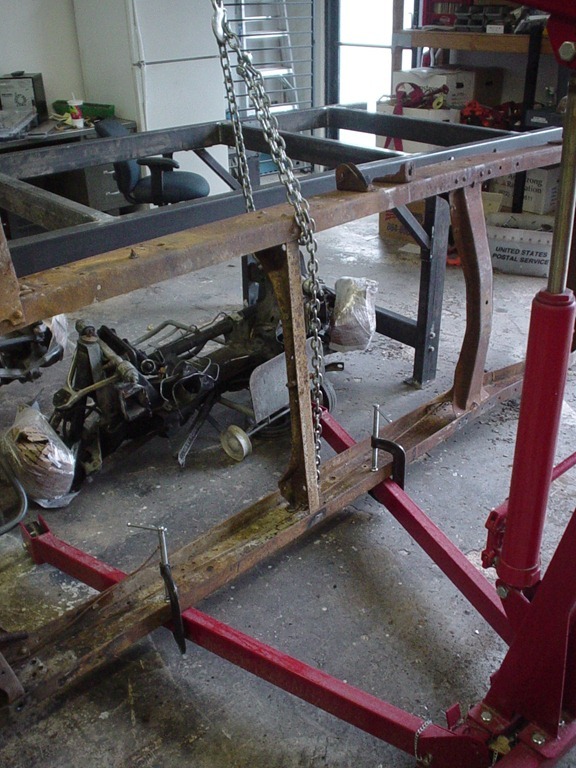 As you can see in the pictures I used the engine hoist to raise one side of the frame while the other side of the frame was kept under the engine hoist. While I stood on the engine hoist’s legs and jacked up the engine hoist, this provided the necessary leverage to allow the parts to break apart. I didn’t want to put too much stress on the frame, joist and myself so I took my time making sure I was working the frame to release any tension. After a bit of work i was able to separate one frame rail from the frame. This entry was posted on November 1, 2010, 10:54 pm and is filed under chassis. You can follow any responses to this entry through RSS 2.0. You can leave a response, or trackback from your own site.